While the discovery of gold along the Blue River, in 1859, might have spurred the founding of Breckenridge, its scenic splendor, and multi-seasonal activities help make it a popular destination today. Ski runs opened up on Peak 8 in 1961, and a new “rush” of winter sports have helped develop Breckenridge into the gem it is today. I wish I could say I’m an avid skier, but I’m not. I just don’t have the balance for it. So I stick to something a little more my speed...snowshoeing. 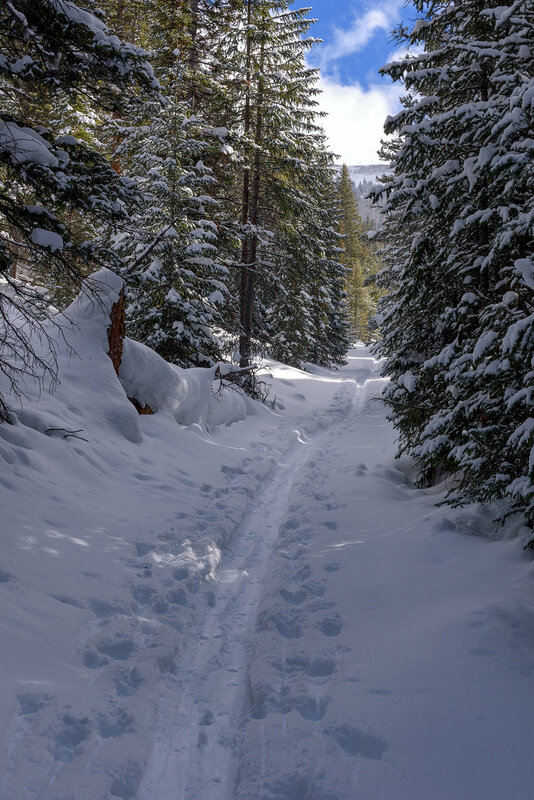 There are many snowshoeing options very close to downtown Breckenridge. You’ll find easy, family-friendly trails, and some difficult ones too. Gold was discovered in the French Gulch area, in 1860...so I decided to stick with my “Gold Rush” theme, and made my way to trailhead parking lot. There are actually two trails that can be accessed from this parking lot, French Gulch, and Sallie Barber Mine Trail. After you pass the gate, stay to the left (on the service road), and you’ll be on the trail for French Gulch. There are several cabins along this service road, all on private property, so stick to the trail. It doesn’t take long for scenery to take command of the hike. Mt. Guyot (named after Arnold Henry Guyot) dominates the views. Guyot was a Swiss-American geologist, and one of the father’s of modern glaciology. He also helped establish weather monitoring stations, which lead to development of the U.S. Weather Bureau—our modern day National Weather Service...that’s cool! 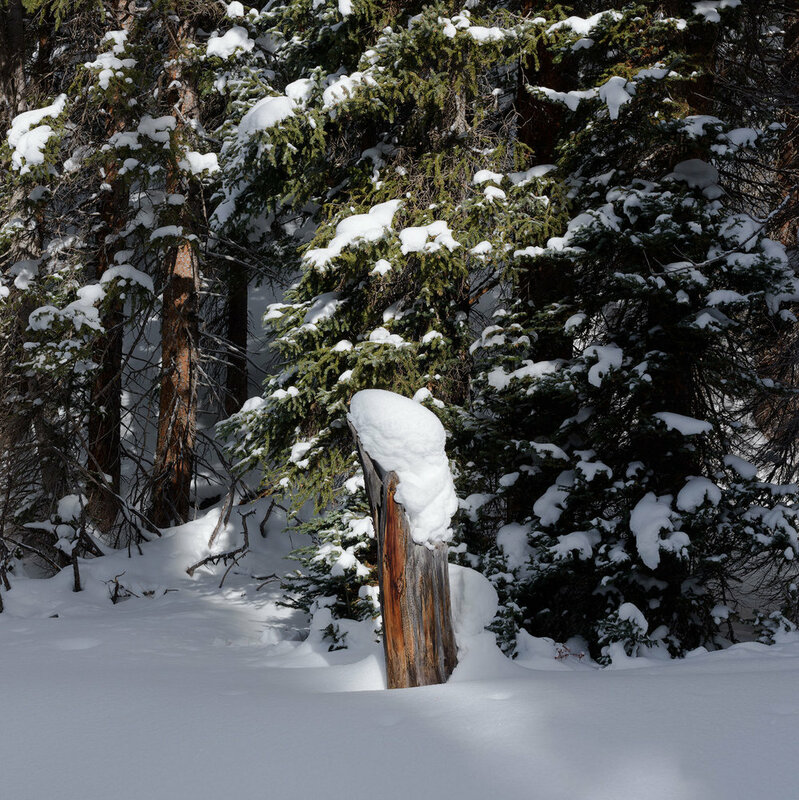 Breckenridge averages 300” of snowfall. That’s 25’ of snow! I’m not sure how much snow was on the ground while I was there, but it was deep. If you’ve never been on snowshoes before, it’s pretty easy. And it gives you a chance to cross over terrain covered in a lot of pristine snow. There is a lot of activity on French Gulch Trail. XC (cross-country) skiing was definitely the most popular. But I did see other people out for a simple stroll. The trail itself was well packed, so you could walk on it with just hiking boots. So, since I was looking to use my snowshoes, I hopped on the Little French Gulch Trail, which was about a mile from the parking lot. This trail hadn’t been used much, so the snow was nice and fluffy. Little French Gulch makes a gradual climb along the hillside, and offers some of the best views of the valley below, and the snowy peaks above Breckenridge. 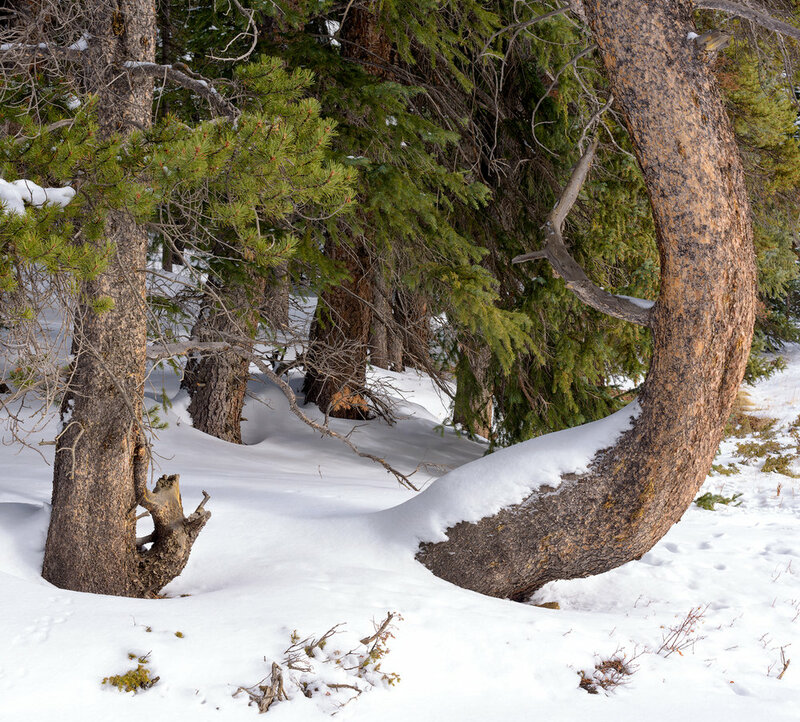 The fresh snowfall was still weighing heavy on the trees, and was slowly slipping off by early afternoon. The glistening sheets of dropping snow shimmered in the bright sunlight. Beautifully silent. Almost all sound was muffled by the heavy snow blanket. While I didn’t see much wildlife (only a few Stellar’s Jays), this is moose country, so if you do see some tracks, be aware. The moose like to visit the stream in the valley, and it’s good idea to stay alert. Moose can be aggressive, especially if they are startled. Depending on how much time you want to spend, you can explore several miles of snow-covered terrain. But, the afternoon was slipping away from me, so headed back to the parking lot. Whether you’re a die-hard skier, a terrain park snowboarder, or a solo snowshoer; the Breckenridge area has you covered. Breckenridge also has a fun downtown, full of history and interesting shops. So, make a day of it. 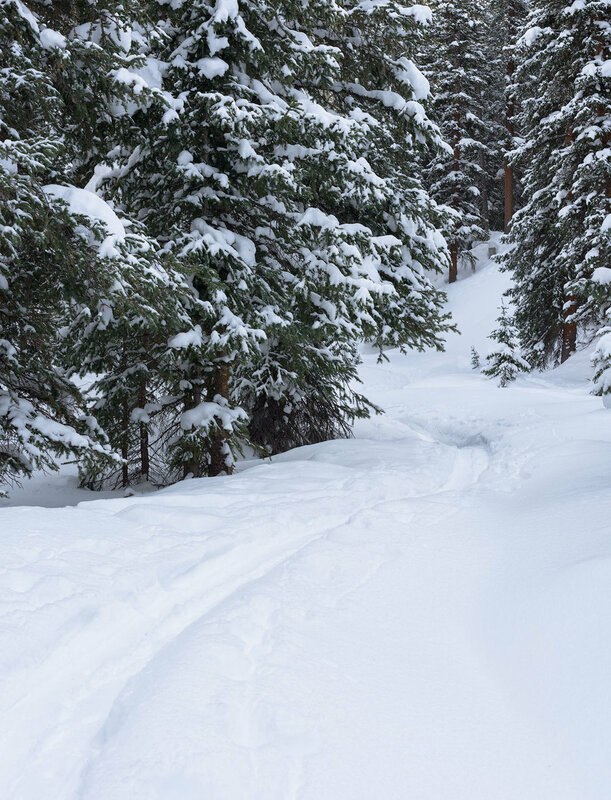 Hit the slopes, or a trail, exploring the present (and the past) of Colorado.